Using an exercise ball as an office chair can be a fun way to work. Whether you spend your time at the office or studying at home for an upcoming exam, office ball chairs can help you in a lot of ways. Here are some benefits of using an exercise ball as an office chair. 1. Strengthens the correct alignment of the spine. Because an exercise ball is not stable, your body should try to balance it. Perfect spinal posture is by chance the easiest to balance with. Therefore, your body will automatically attempt to line up in the correct posture. This helps refine your spinal health and reduce back pains. 2. Improve your balance. Sitting on an unstable surface throughout the day will improve your sense of balance as well as the response of your muscles. The result is a better overall balance, which can be observed outside the office. 3. It forces you to change position frequently. An exercise ball forces you to change your position often to maintain balance. For an instance, if you turn 45 degrees facing the phone, your body will assume a new position. This reduces the damage caused by the prolonged sitting in the same position. 4. Improves your circulation. Using an exercise ball will keep the blood circulating to all parts of your body throughout the day. An office chair, on the other hand, reduces circulation on certain parts of the body after prolonged use. 5. Exercise is within reach. Another good thing about using this replacement to a chair is that you can do stretches or mini-workouts whenever you like, without getting up. If you are waiting for a few minutes, you can make a productive use of that time with a quick stretch or workout. Because it is much more practical, it is likely you will do more, resulting in better health. 6. Get that 6-pack that you want. Your body mainly uses its core muscles (abdominal muscles) to compensate for changes in balance. Therefore, using the ball gives you a simple ab workout. This may not sound like much, but consider the time spent on your computer at the office or at home. These hours can accumulate and lead to strengthening of the abdominal muscles. 7. Burn up to 350 calories each day. More movement during the day = more calories burned. Burn 350 calories a day = lose a pound of fat every 10 days. You might not burn enough 350, but nevertheless, this will help you stay in shape. 8. You will feel more energetic. It has been shown that staying in one position will make you more exhausted while moving and being active will give you more energy. 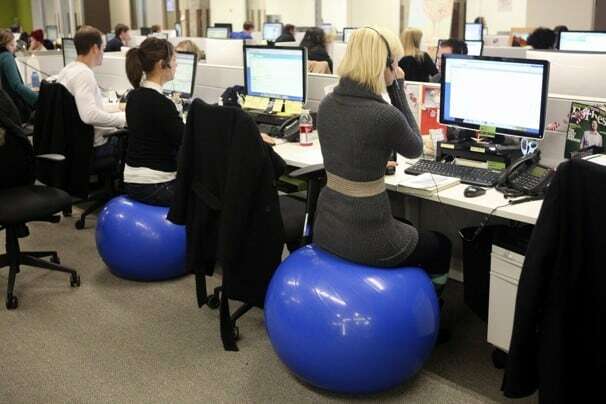 With an exercise ball as a chair, you will feel much more energetic after finishing your work. 9. Very cheap. 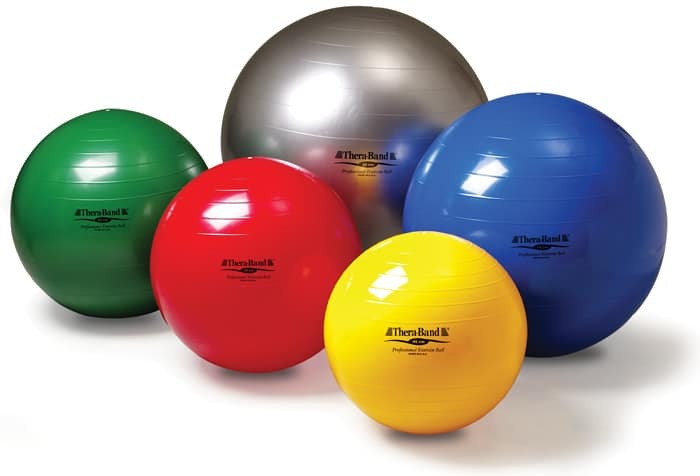 Specialized exercise balls designed for seated use can range from $15 to $80. Much cheaper than purchasing an ergonomic chair, it can range from $100 to $400 and up. 10. Come on, it's fun! Who does not like the idea of bouncing on an exercise ball all day. Exercise balls are an exciting replacement to chairs, and they can add a fun spark to your day. Update: Make sure you know what size suits you. Your legs should be almost parallel to the ground. If you have a personal experience of using the exercise ball as a chair, drop us a comment on how it worked for you.